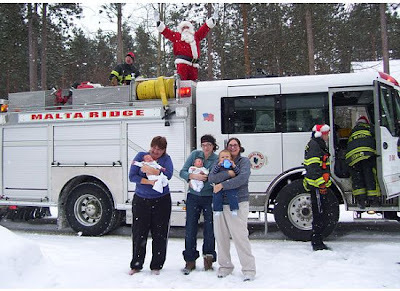 The FamiLee Jewels: Firetruck Santa Saturday...does Santa look a little familiar????? Firetruck Santa Saturday...does Santa look a little familiar????? 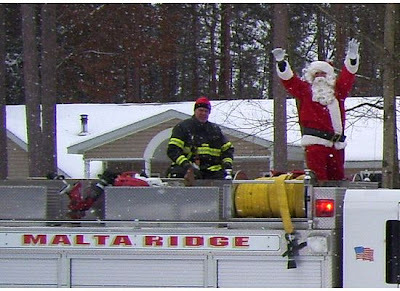 Every year on the Saturday before Christmas our local firefighters from the Malta Ridge Volunteer Fire Department delight young and old residents by driving around our neighborhoods, greeting local families, and passing out candy canes all while giving Santa a ride on the top of the truck. Becky and Melissa have not missed a Firetruck Santa Saturday in 22 years. This year we had planned to have a Holiday brunch with snow tubing, lots of great food and out of town guests but 12 inches of snow and another big storm on the way changed our plans. Becky still made it down from Glens Falls with her 3 little ones, so we had breakfast and went snow tubing while waiting for Santa. Freddy J loved the snow, laughing all the way down the hill on his snow tube that was so big he could lay down in it. Liam and Rory were less than thrilled about the cold so Auntie Lissa took them back inside where the 3 of them stayed nice and toasty by the fire. Finally after much waiting for them we heard the sirens grabbed all 3 boys and ran outside. To find that Pip was helping out Santa. Santa-Pip was on top of the Firetruck Ho-Ho-Ho-ing at the top of his lungs! (Pip does not need a PA system). He was obviously having a great time. The firemen were kind enough to get out and take pictures for us. Freddy loved the truck and Santa (he saw them last year but I don't think he remembered), the twins were just happy to have full bellies, and Fred, Melissa, Becky and I are happy to have carried on the tradition with a new generation of the FamiLee. You had the snow too? Looks great for Christmas but it changed plans here too in MA. Fortunately, we were not in the group that was (is) still recovering from last week's ice storm. The utility claimed to have used 4 year's worth of replacement wires and equipment just to repair the damage so far. Yes Bev we got it too. As a matter of facT our out of town guests live in Andover. lets hope we do better with tomorrows wintery mix forcast.